A few weeks ago, I woke up with a strange craving. I wanted cranberry muffins. 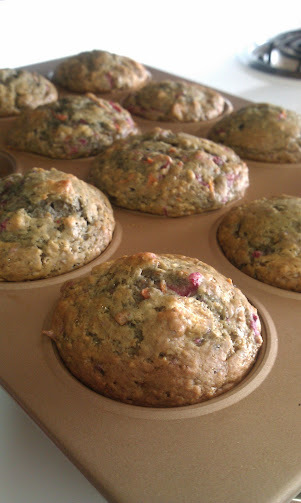 But I also wanted morning glory muffins. I had carrots in the house and for some reason, the idea of eating some of them for breakfast would not get out of my head. I didn’t actually know what was in morning glory muffins, despite how much I enjoy them. And while all the recipes I found sounded delicious, I didn’t have any pineapple, coconut or raisins, and I wanted something with a bit more spice. 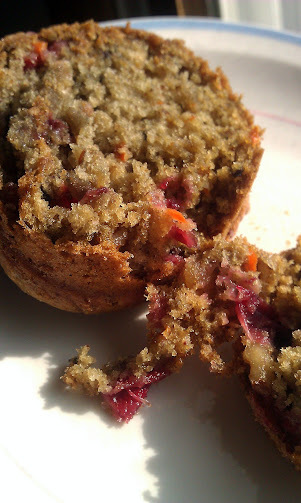 So I searched for carrot ginger muffins, and found this delicious-looking recipe. And so began my very first “invented” recipe. My modifications from the original recipe were pretty simple, actually. I used a “flax seed egg” as detailed in the original post, and vanilla almond milk instead of dairy milk, making the recipe fully vegan. But where I got really crazy was that instead of using a 1/2 up of raisins, I used a 1/2 cup of my homemade cranberry sauce. This was a little risky, because the cranberry sauce is basically a liquid ingredient, so to balance the additional moisture, I slightly increased the amount of flour in the recipe to 2 1/4 cups. The muffins did take 18 minutes, the upper end of the cook time of the original recipe, to set fully in the center. They needed a few minutes on a wire rack to firm, and the texture of the muffin overall stayed moist, for the entire week or so it took me to eat my way through the batch. But… it worked! And they were really delicious! I was so excited with my kitchen innovation that I texted my pastry chef little sister, who was very proud of me for both my ingenuity and my vegan baking skillz. Ok, so I used another recipe as a base, and I’ve certainly modified recipes before. But with the exception of substituting applesauce for eggs, I usually don’t modify baked goods, knowing there’s a good deal of chemistry involved. And I have certainly never done something so adventurous as add a completely different flavor and liquid ingredient before. So when these muffins turned out deliciously, I cannot express just how proud I was. As I’ve told you all before, I spent most of my life thinking of myself as a total failure in the kitchen. Learning I could learn to cook was a huge victory for me — cooking well is all bonus, as far as I’m concerned. Never did I think I could come this far. Never did I think I would have the knowledge — or the guts — to try something outside the box when it came to baking. Having it turn out well is the ultimate prize for an awkward clumsy nerd turned-food advocate, because it means what I say is true. Anyone can do this. Trust me. When you settle in to enjoy two warm, soft muffins that are your idea and your recipe with a cup of coffee on a winter Saturday morning, the burned cakes and smoke-alarm fries and leek tarts will all have been worth it.